Perfetti Started a Promotion " Stop Not". They are giving Rs 10 Talktime to lucky winners. All you need to do is to call a Toll Free number and Follow a simple process. 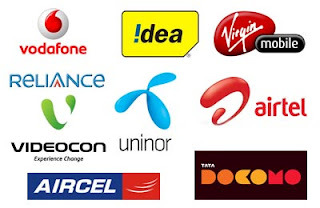 How To Get free Rs.10 Talktime by Calling a Toll Free Number? Call the Toll free number 1800 102 3006. You will be told to record “Stop Not” in your own unique style. Record your voice once the music ends and you hear a small beep for 10 Seconds. You will be confirmed that the recording has been done and will be notified by an sms in case of winning. The Maximum winners of the day will be 1836 winners a day. 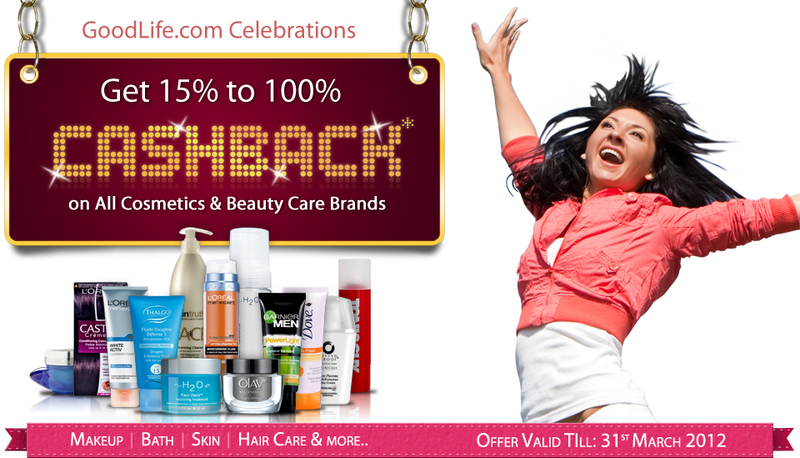 Campaign is valid from 16th March 2012 to 4th April 2012 ('Promotion Period'), both dates inclusive, in India only. Consumer will call on a Toll Free number 1800 102 3006, to participate in the campaign. A consumer can participate a Maximum of 3 times in the campaign, but can win the gratification only once in the entire campaign. 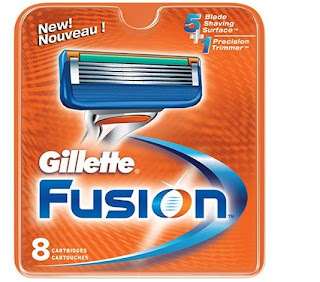 Gillette is running a promotion on their facebook page as "Lipstick Movement" where they are giving Free Gillette fusion Razors daily to 10 Lucky Participants. To participate in this contest, you need to give a misscall on 08030050035 then register with received code on their facebook page to become eligible to win Gillete fusion. How to Win Gillette Fusion Razor worth Rs 299 ? Enter your other details . You can check winners daily by "clicking here"
How to get Eyeglasses with Anti-Glare Power Glasses worth Rs. 850 at just Rs.199 only? Pay Remaining amount and Checkout. There are many frame designs available and best part is you can Pay Cash on Delivery also. 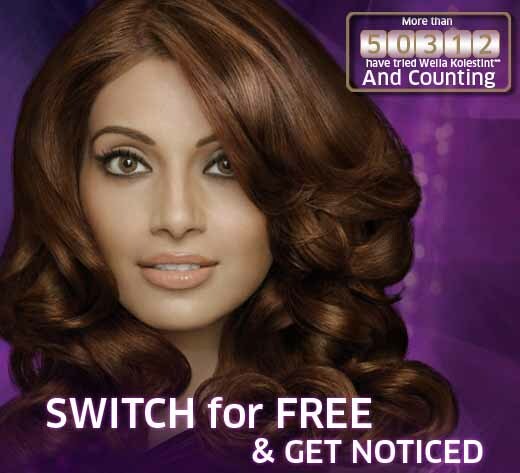 Once again Reward.me has come up with great freebie where they are giving Free pack of Wella Kolestint hair color. All you need to do is to follow the below process and get yourself a Free hair color worth more than Rs 400. How to Get pack of Wella Kolestint hair colour for free? Answer few simple questions and you are done. Special Thanks for Ashish for sharing this deal with us. What is the Assured Free Gift? 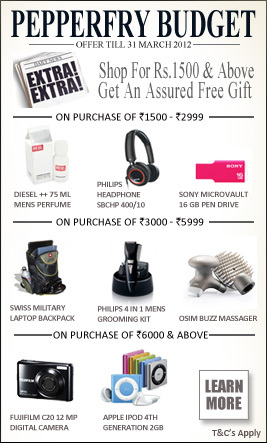 To get your assured free gift you need to shop at least for Rs 1500. They have 3 slabs which are showed below. You can get free products like Diesel Perfume worth Rs 2800 , Philips headfone, Ipod Shuffle, Fujifilm Digital Camera etc. After the payment , you will be asked to choose one products from above. 6. Multiple order purchases cannot be combined to claim a gift under the promotion. Amount paid value basis single order will be considered for qualification. uRead.com is a new online Book Shop. It already has a collection of over 5 million titles and thousands being added every day. We are posting about uRead.com because they are giving a good offer on all Children's Books. They have more than 800 Books on which this offer is valid. Best part is cash on delivery is valid with free shipping. 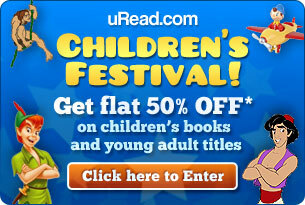 How to get Flat 50% off on Children's Books? Note: Cash on Delivery is applicable on all orders, Free Shipping. Infibeam is giving Sandisk Micro SDHC Card 8GB ( Class 4 ) at Rs 249 as their deal of the day. 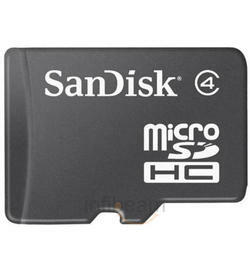 MRP of this Sandisk Micro SDHC Card ( Class 4 ) 8GB is Rs 1199. You will get 5 Years Manufacturer Warranty along with this purchase. This comes out to be a good price for a GB Memory Card if you are looking for it. How to get Sandisk 8GB Class 4 Micro SDHC card at Rs 249? Pay Rs 249 and checkout. Here comes the amazing offer from GoodLife and Firstcry. GoodLife and Firstcry are sister concerns. GoodLife is a online store for all your cosmetics, Hair Case, Personal care, Make up needs etc. Firstcry is a dedicated website for all your baby needs. When you purchase at GoodLife/Firstcry you get a Cash back of 15-100% on every order. This offer is valid till 31st March. Order total should be more than Rs 750They have a huge variety of products and rates are already discounted. How do I get the Cashback Offer? You get an email with a Cashback Coupon worth minimum 15% and up to 100% of Your Purchase. feel free to enjoy any other great offers we will be sending you. You get an additional Cashback. When Do I get the Cashback Email? In case of Cash on Delivery orders, the email reaches you after the delivery of the order is completed. How to I use the Cashback amount? This purchase will have no minimum or maximum limit. When does the Cashback Offer not work? The Cashback is not valid on purchase of Diapers, Women's Hygiene or SuperSavers. Example: If you purchased worth Rs. 1500, of which Women's Hygiene purchase is worth Rs. 500, then you get a coupon code worth 15% to 100% of Rs. 1000 only. How to get Started to get this offer? 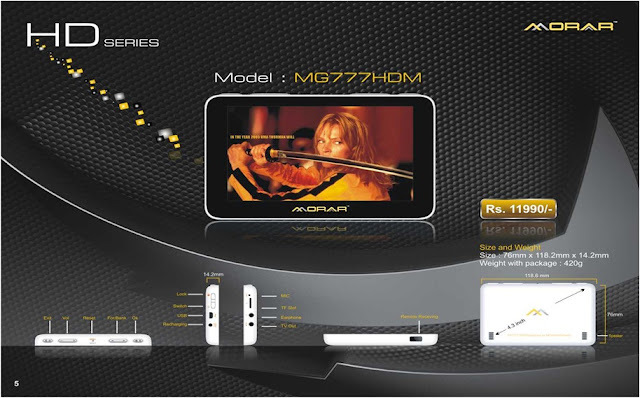 Today's Deal for Tradus is Morar 8GB Full HD MP5 Player worth Rs 11900 for just Rs 1999. Now Watch movies and videos on this brilliant 4.3 inch screen displaying 160 million colours in 800 x 480 resolution. Comes with HD A/V out so you can play on your TV or projector. Con-verts all formats. Includes licensed Real Player. How to get Morar 8GB Full HD MP5 Player worth Rs 11900 for Rs 1999? 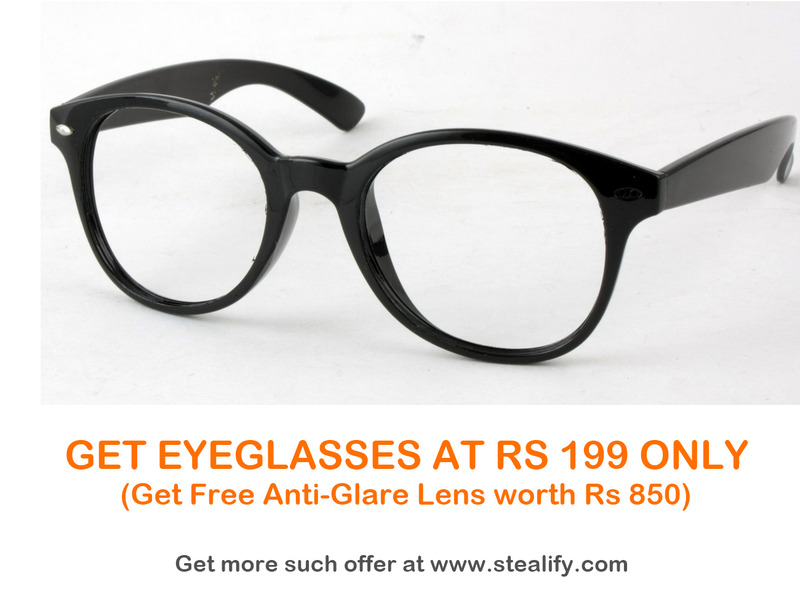 Pay Rs 1999 and checkout.